The Hero Indian Super League (ISL) returns to action for the first time since the mid-season break in December when Kerala Blasters hosts ATK at the Jawahar Lal Nehru Stadium in Kochi on Friday. In the wake of their demoralizing defeat to Mumbai City FC in the final league game before the break, Kerala Blasters parted ways with then manager David James by mutual consent. The Englishman's catastrophic start to the ongoing season worked out as the Kochi-based franchise's worst ever start to a campaign and their 6-0 loss to the Islanders - their biggest in the competition - proved to be the final nail in the coffin. 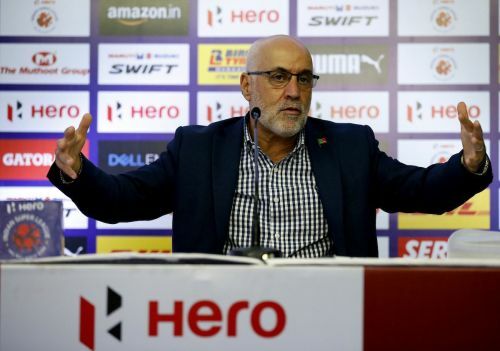 Despite their several shortcomings so far this term, Nelo Vingada, who has been appointed as James' successor at Kerala Blasters, remains confident in the quality of the squad at his disposal ahead of the meeting with ATK. The Portuguese tactician insisted his players must learn from the past, but also remind themselves that it is a new beginning for everyone under his tutelage, starting with the game on Friday. “I always say that the next game is the most important and difficult", Vingada told Sportskeeda during the pre-match press conference ahead of the meeting with ATK. "We had our only win of the season against ATK on the opening day, but we can’t keep thinking about the past. Like I said, we need to understand from the past, but also remember this is a fresh start for all of us. "I’m very optimistic so I want my players and fans to be happy and for that we need to win the game tomorrow." Vingada also admitted it is imperative that the players take his message to heart and co-operate with him to implement the ideas on the pitch for a positive start. "The most important thing about tomorrow is that I must get my message across to the players without any confusion and it is equally important they co-operate to express my ideas on the pitch", he added. The Kerala Blasters' coach even went on to claim that his players must play the game of their lives against ATK on Friday to conjure a reaction and restore some much needed confidence within the dressing room. Vingada also urged the 'Manjappada' to turn up in numbers and show their support for the team on Friday. "I have already told my players that tomorrow will be the game of our lives, because we need a reaction. After that, it’s another game and a completely different scenario altogether", he continued. "I also invite the fans to back us in numbers tomorrow, because if we want to win, then the support from Manjappada and every single fan out there is very important." 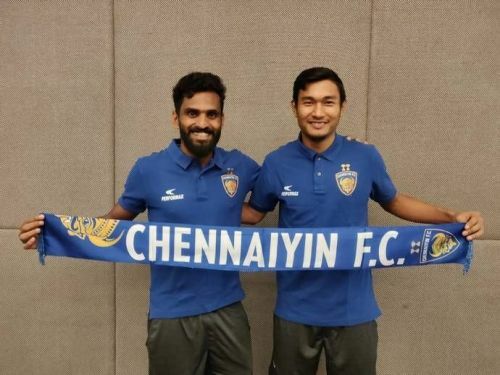 The Kerala Blasters confirmed earlier today that both CK Vineeth and Halicharan Narzary will join rivals Chennaiyin FC on a temporary deal until the end of the season. However, Vingada revealed he would have ideally wanted to keep both players, since he feels they make the side a better unit. The Portuguese manager also admitted the wheels were already in motion for the deal to go through, even before he arrived at the scene in Kochi. “The decision to send Vineeth and Halicharan [Narzary] on loan was made before I arrived", Vingada revealed. "Vineeth scored against my North East United side and he could have been a key player [if he had stayed]. The same goes for Halicharan, who was one of my best three players during my stint with North East United and he is now a regular for the national team as well. "If I had come in before the deal was sanctioned, I would have kept both players since I believe they make our squad better. Despite missing out on the services of two key first team players to direct rivals, Vingada claimed he is not too bothered by it and vowed to make the best use of his current crop of players available for selection. "It is in the past and I can’t keep thinking about it. For me, the players that are here now are like family and I will go ahead with them and fight for the rest of the season", he claimed. Vingada also stressed on the fact that he is keen on providing opportunities and nurturing the young players within the Kerala Blasters' squad rather than swooping in for potential ready-made replacements available through the transfer window. “We have signed Baoringdao Bodo, but there is still room for another player and we are currently discussing the possibility of filling that gap", he added. "I prefer to choose someone already in our ranks and waiting for an opportunity because I believe we have good young players who can represent the club on a regular basis. “I have always preferred to give local players a lot of chance in the past and that will continue with Kerala Blasters. "I strongly believe we have enough quality in our squad [to cope with the departure of Vineeth and Narzary]. I cannot complain or think too much about wanting replacements at the moment and I will try to put on a good fight with the current crop of players at the club." The AIFF handed out a six-month ban to Zakeer Mundampara for his antics against the referee after being sent off during the defeat to Mumbai City FC and Vingada admitted it is indeed a huge blow for his side. However, the 65-year-old also insisted he will not be losing his sleep over the situation with respect to Zakeer, since it happened before his arrival and because he could have done nothing to justify the player's actions. “This (the incident that awarded a ban to Zakeer Mundampara) happened before I came in, but usually a six-month ban in Europe or Portugal means the behaviour of the player was very tough and rash", Vingada conceded. "Zakeer was one of the players who was involved a lot with the team and the ban is a huge blow to us because now we will have to look for someone who can cover for Nikola (Krcmarevic). “I feel bad for the player because he cannot play, but I won’t lose my sleep over it and we have to move forward." Vingada also tipped his hat towards ATK by claiming he has a lot of respect towards the opposition ahead of the meeting on Friday, but reiterated on the fact that his players must focus on improving their performance rather than paying too much attention to the opponents. "I respect ATK, but I feel we need to focus more on ourselves to do better than what we have done till now", Vingada opined. "We must behave like fighters and warriors on the pitch tomorrow and with a little extra input from everyone involved, we can hopefully get a win. “I hope to pass on the positive energy that I brought with me from Portugal to the players and we must take it game by game at this stage. "We have got six games left and a cup competition coming up later, but it is very important that we must not get ahead of ourselves." The corresponding fixture between the sides during the inaugural game of the ongoing ISL season ended in a 2-0 win for Kerala Blasters, but the Men in Yellow have yet to reciprocate the same result since then. Nelo Vingada in Kerala Blasters - Short-term fix or in it for the long run? ISL 2018-19: India's Sandesh Jhingan on his way out of Kerala Blasters?